The Department of Social Services were moving into a new premise in Hobart that required a full refit of a complete floor. The new space was to incorporate both workspace, collaborative zones, meeting spaces, breakout and large conference rooms. The design incorporated colours and textures referenced from the Tasmanian landscape which created a fresh and vibrant colour palette. Custom graphics were used on glass partitions which helped to create a specialised identity for the space that was unique to the Department of Social Services. 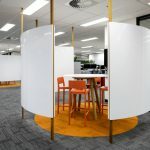 The design was to incorporate the government agencies design standards and security requirements with IA Design liaising with project managers, the department, security consultants and the head contractor. The project was delivered in a very tight briefing, design and construction program of 7 weeks. The result is a smart, modern and inviting workplace that was completed on time and within budget.